Banshee rejoins the X-Men only to discover the team has been replaced by an army of techno-organic beings known as the Phalanx! He assembles a ragtag team of X-Men, mostly made of prisoners lying around the Mansion. He, Jubilee, the White Queen and Sabretooth set out on a mission to protect the next generation of mutants starting with Thomas Everett, a teen from St. Louis. After saving Thomas, their alliance is no more, as Sabretooth escapes! ...who has the mutant ability to stretch but lacks the elasticity of other heroes like Mr. Fantastic and Plastic Man which makes him kinda droopy. The captured mutant teens begin to access the situation, some are hopeless, Paige is hopeful and Monet, whom we met last issue, is catatonic. Paige then discovers that unlike the other mutants, she’s infected by the Phalanx and her assimilation has begun. What’s left of the X-Men travel to San Francisco to the home of Emma Frost to access her computer, which contains the blueprints to the SHIELD base in the Bay Area, where they can pick up on any spikes in Techno-organic activity. Banshee and Emma leave to find out if SHIELD can help. Leaving Jubilee and Thomas to bond. Frost mentallyblocks their bodies out from being able to be seen by the SHIELD agents but forgets to block the rain water dripping off them and they’re discovered.Banshee assists with a Sonic scream. Meanwhile inside the Phalanx, Monet finally speaks and quickly disrupts the power source and takes out the big guy. She figured out he was a plant and part of the Phalanx. She then busts them out, even taking the sick Paige, showing that they're now a team. In San Diego Bay, the Phalanx, respond to the escape of their captives and have Clarice in their clutches. The others implore her to use her powers but she’s reluctant, finally she gives in and blinks them apart and Monet finishes the job. Only to discover that Harvest is back! The X-Men arrive on the ship. As they enter the boat, Jubilee and the Emma discover that the Phalanx on the ship have even assimilated the rats on board. Jubilee acts as the exterminator. As Harvest closes in on the teens, Sabretooth saves them, apparently he just escaped to get his costume. With Banshee’s help they stop Harvest temporarily. Imagine seeing Sabretooth for the first time! 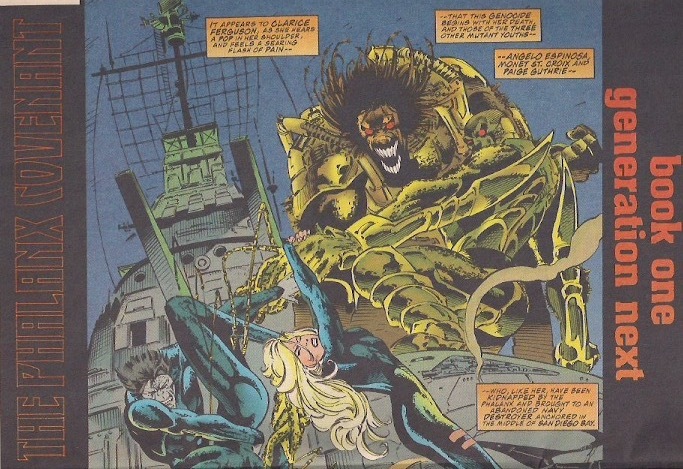 They meet Paige and see that she’s infected and Sabretooth has a novel way to remove it by clawing at her. Paige completes the removal of the growth by showcasing her mutant power. Farm girl can husk herself just like corn? Freaky. Harvest attacks again and gets the better of Banshee and Sabretooth. Clarice realizing that she’s their only hope sacrifices herself to save her new friends. She’s trapped by her own power. She and Harvest disappear from existence. Blink's power was pretty cool. Too bad she blinked herself out of existance. 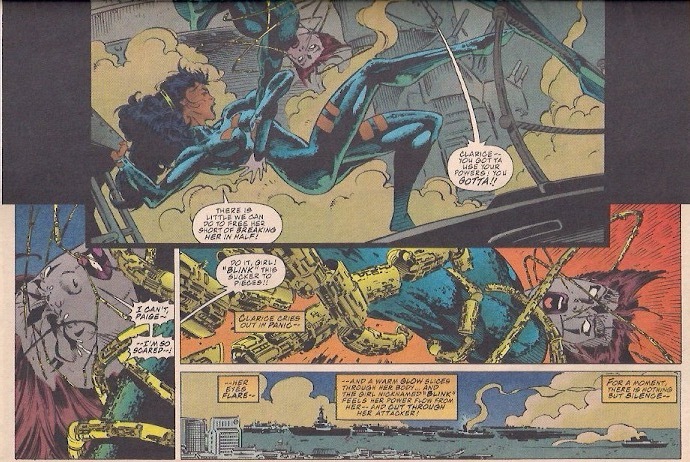 Skin, Paige, Jubilee, Thomas Everett and Monet regroup on the docks to mourn Clarice’s death. To me 1994 doesn't seem all that long ago until I see the pants the kid leaning on the box is wearing. One of the things that I liked about this series was the inserts with time lines of different X-Men characters, Bishop, Cyclops, Cable and Banshee, helping new readers learn about past X-Men stories. It was one of my favorite parts of the book as a kid yet I had forgotten all about it. This series was fun to read. The Phalanx was hard to describe as a villain, it’s a sum of its assimilated. And as a result, it was interesting to have Harvest cut off from the hive, so that he could be beaten because he lacked the power of the collective and began showing signs of individuality, symptoms of his being unable to draw from the hive. He was desperate enough to assimilate rats to take their energy. I also liked how the team had to bond together over Clarice’s sacrifice and learn to work together. Part of the point of Generation X was to have less glamorous mutants and they sure delivered. Skin is like Mr. Fantastic without the elasticity, so he looks like he has extra skin, Husk is the traditional blonde pretty girl who can rip her skin off, later we would meet Chamber, who has Cyclops’ power of energy blasts but emitting from his chest and he blew off his own jaw. These X-Men were grittier and certainly not prettier than their predecessors and it made for a fun read. This is also the first time we saw Emma Frost as a member of the X-Men, she would play a major role ever since. The series Generation X turned out to be pretty popular even resulting in a low budget TV movie on Fox, that had it been successful would have run after the X-Files! You can check out the whole movie here!